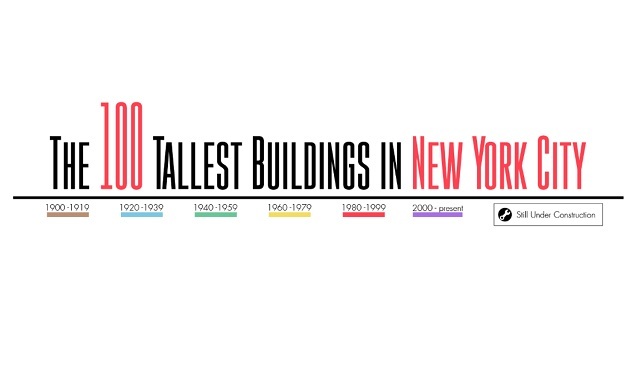 Chart: The 100 Tallest Buildings in NYC #infographic ~ Visualistan '+g+"
What is the first image that pops into your head when you think of the New York City skyline? It’s likely either the Empire State Building or the Chrysler Building. Both iconic buildings have stood tall in Manhattan since the 1930’s, and remain in the Top 10 tallest buildings in the city. That may lead some to believe that New York’s skyscrapers are mostly older buildings, and remnants of the Great Depression era. The reality is that several of the Big Apple’s tallest buildings were built within the past 20 years, with many more currently under construction. This illustrates just how quickly the city’s skyline is changing with modern advancements in construction technology. Where once stood the mighty World Trade Center’s twin towers, we now have One World Trade Center in its place. Recently completed in 2014, One World Trade Center is now the tallest building in the Western Hemisphere. Which future buildings may claim the title of “tallest building’ in NYC? We can only guess, but we can be sure that many more skyscrapers are on the way! For now, enjoy this comprehensive look at 100 of the tallest buildings in NYC, arranged by height which was brought to you by TopViewNYC.com.